It’s Jamie again and today I will be discussing the single point piercing (surface anchor, dermal anchor, microdermal). Single point piercing is a technique that is essentially a single-point pocketing. It gives the appearance of a small single bead on the skin, similar to a transdermal implant, but with an easier procedure. Single point piercing also has an easier removal than an implant removal. Because of the small size of the jewelry can be placed almost anywhere on the body, although healing can be difficult on areas of high movement or places that get knocked. You can even do multiples to create really unique patterns. Body jewelry is worn inside a wound and is in contact with your internal tissues, only certain products are suitable. The look of the jewelry that is placed in your fresh piercing must be secondary to aspects that affect safety and compatibility with your body. The size, style, material, and quality of the initial piece of jewelry all affect your ability to heal. The jewelry can be changed after you have successfully healed. Because the body jewelry industry is saturated with substandard products, piercers and clients alike may forget that cost alone should never be the key factor in your purchase. The simplest way to describe the jewelry is it looks like a flat plate which sits beneath the skin with a single exit for a barbell post giving the visual effect of jewelry (a bead, spike, etc.) that appears to be screwed right into the body. Jewelry for this piercing should be made of titanium. Titanium is a lightweight metal that is ideal for people with concerns about nickel sensitivity. This material can be anodized to create jewelry of different colors without affecting the safety. Look for implant certified titanium (Ti6Al4V ELI) that is ASTM F-136 compliant or ISO 5832-3 compliant, or commercially pure titanium that is ASTM F-67 compliant. 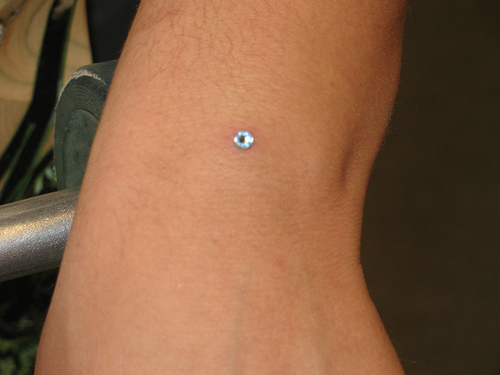 This piercing can either be done with a needle or a dermal punch. Either way is fine depending on the piercers preference. The jewelry is placed into a pocket beneath the skin. The jewelry typically has a hole or multiple holes on the flat plate that is placed under the surface. Your skin with heal and grow through these holes to help firmly hold your jewelry in place. An internally threaded post will protrude to the surface making it easy to change your jewelry tops for your desired look. The healing time on this piercing can be one to three months depending on placement, after care, and your body. There is no need to twist or touch your jewelry, as this will only irritate your new piercing. It is very important to avoid snagging this piercing. You need to be aware at all times of things that could catch it such as; clothing, loofahs, wash rags, and towels. To clean your piercing you can either use H2Ocean or a saline soak. With the H2ocean spray both sides two to three times a day. You can make the saline soak at home by using a non-iodized sea salt mixture: Dissolve 1/4 teaspoon of non-iodized (iodine-free) sea salt into one cup (8 oz.) of warm distilled or bottled water, soak for five to ten minutes two to three times per day. Dry by gently patting with clean, disposable paper products. Cloth towels can harbor bacteria and snag on jewelry, causing injury. Some risks can be migration, rejection, scarring, and snagging accidents. To remove the jewelry, the area around it is massaged, and the piece manipulated gently out. A small cut may need to be made to remove this jewelry if the tissue has grown to the plate. Having this jewelry surgically removed by a doctor is a common misconception, any piercer that is able to insert the jewelry for you should also be able to remove it. Dermal anchors are great for a unique look since they can be put in a variety of places on the body and in a variety of different patterns. Since they are a more advance piercing to heal most piercers prefer to do these on adults (18 years or older). For any further questions feel free to contact any of our piercers at Blue Boutique.